Prof. Kaaryn S. Gustafson, Director of CLEAR, was keynote speaker at CLEAR’s April 2014 symposium, where she discussed her recent book, Cheating Welfare: Public Assistance and the Criminalization of Poverty. CLEAR hosts symposia bringing together scholars, legal practitioners, policy makers, and other contributors to examine complex topics such as critical race theory and the interplays of race, class, gender, justice and the law. Race and debt are both American institutions but are rarely discussed in relation to one another. 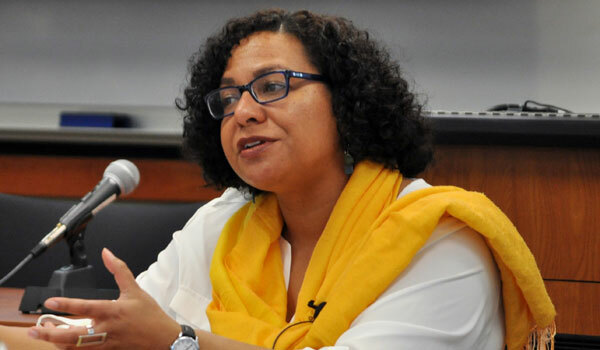 The 2018 UCI Law Review Symposium, organized by the School of Law’s Center on Law, Equality and Race (CLEAR), was a vibrant discussion bringing together innovative individuals working in financial services with legal scholars and scholars from a wide range of disciplines in the social sciences to discuss racial disparities in debt and the role of legal institutions in creating, perpetuating, and addressing those disparities. Speakers examined topics including banking, consumer credit, child support debt, criminal debt, and bankruptcy. Discussions touched on legal history, public policy, and the role of legal reform in addressing racial and economic inequality. National scholars from various disciplines convened to participate in conversations organized around the following panel topics: Unequal Burdens of the Collateral Consequences of Incarceration (a panel proposed and moderated by UCI Law students);Critical Analyses of Crime, Punishment, and Intersectional Identities; and Interdisciplinary Explorations of Identity, Crime, and Punishment. Papers from this symposium are published in the UC Irvine Law Review, VOLUME 5: ISSUE NO. 4. CLEaR co-sponsored this event as the first public symposium of a group of law, humanities and social science scholars looking at empirical studies of race and identity, and critical work looking at similar subject matters. Panels featured legal and social science perspectives on various issues at the intersection of the empirical and doctrinal/critical study of race. Papers from this symposium are published in 3 UC Irvine Law Review 467 (2013). This two-day conference engaged academics, legal practitioners and policy makers in dialogue about the effects of alarming statistical disparities on access to opportunity in the United States. Participants examined the interplay between race and class in a variety of different substantive areas. The April 2012 UC Irvine Law Review featured the article “Revisiting the Work We Know So Little About: Race, Wealth, Privilege, and Social Justice,” written by Stephanie M. Wildman, Margalynne Armstrong, and Beverly Moran, about the issues discussed at the symposium.